FEATURES: 1 Temper Anchor 50' VLA Shock Pack Positioning Device with 18" extension lanyard HUV harness Easy Carry and storageThe Guardian Fall Protection "Bucket of Safe-Tie" offers an all in one approach to fall protection. 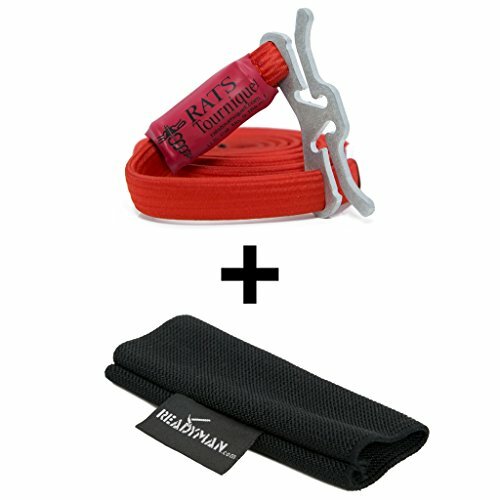 Each one includes a type of anchor, lanyard and harness conveniently carried in a storage device. Bucket, universal harness, temper reusable anchor, anchor screws, and lifeline. Made with heavy duty outer polyester webbing and a polyester core specifically sewn in to reduce impact forces; does not stretch and has no shock pack; lightweight. Our OSHA Approved and ANSI Compliant KwikSafety High Quality Fall Protection Safety Harness is great for any industry and any application. It has 1 -inches wide yellow load bearing straps and black lock stitched webbing to keep you safe and secure while working and if a fall were to occur. Our bright yellow load bearing straps are visible in various weather conditions: direct sunlight, foggy, dusty and dim-light. A Single (1) Dorsal Ring is located on the back of the Full Body Harness and is used as the primary fall arrester attachment. Two D-Rings are located on the hips of the Safety Harness for work positioning uses only. Attachments to the hip rings should be used in pairs for all job types including arborist, utility workers climbing poles, construction workers tying rebar and climbing on form walls. Water repellent safety webbing ergonomically supports back and hips while bearing the weight of the user as well as the weight of tools that may be attached. Here at KwikSafety craftsmanship, care and pride is taken with a critical eye when it comes to our products and to the workers safety. Our KwikSafety 3D Ring Safety Harness meets or exceeds all applicable industry standards including OSHA and ANSI and is Government Approved, DOD Approved, Airport & Port Approved, and RapidGate and TWIC Approved. Great for use at Ports, Airports, Highways, Military Installations and Other Government Facilities. Our KwikSafety Full Body Harness is a One Size Fits Most with a height range of 4'10" to 6'6"; and a weight range of 130 lbs. to 310lbs. If happened to order the wrong size or item, we offer Hassle Free Returns within 30 days if your item was shipped via Amazon FBA! ANSI COMPLIANT: ANSI/ ASSE Z359.11-2014: All of our KwikSafety Full Body Harnesses have undergone the 'Qualification and Verification Testing of Fall Protection Products'. This testing specifies requirements which include the number of specimens to be tested, test equipment to be used, the accreditation of the testing lab and the duties and responsibilities of both the manufacturer and the testing lab. View the Compliance Label/ Safety Label for more information. 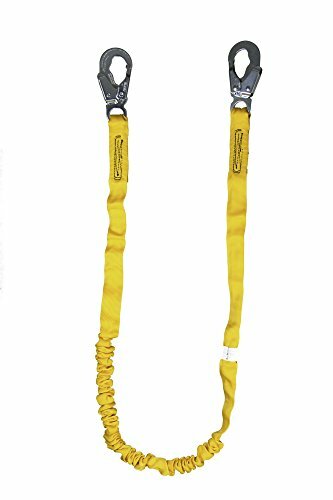 FEATURES: Ideal for positioning and restraint situations Quickly adjusts from 4 feet to 6 feet No shock absorber included Adjustable length between 4 and 6 feet A Guardian Fall ProductThe Guardian Fall Protection "Adjustable Lanyard" is ideal for positioning and restraint situations. This lanyard can be quickly adjusted from 4 to 6 feet in length. This version of the product does not come with a shock absorber. Specially designed with six points of adjustment and stretchable shoulder straps; the product includes: shoulder pads, cradle seat, quick adjust torso buckles, padded waist belt, D-ring lanyard keepers (which double as retrieval hoists), impact indicator, hammer loops and tongue buckle leg straps; the model's size is built specifically for individuals whose height ranges from 5' to 6'3" and whose weight ranges from 140 to 250 lbs. Warranty: Guardian Fall Protection warrants to the purchaser that all products are free from defect in material and workmanship at the time of shipment. Obligation under this warranty is limited to product replacement for the period of (2) years from the date of installation or use by the owner, provided that this period shall not exceed two (2) years from the date of shipment. This warranty is not transferable. No other person or firm is authorized to assume or assign for Guardian Fall Protection any other liability in connection with the sale or use of our products. Furthermore, this warranty is void if any product is changed or altered in any way or if the product is used in a manner other than for which it is intended. This warranty only covers defects in material and workmanship; it does not cover conditions resulting from normal wear and tear, neglect, abuse or accident. All returns to Guardian Fall Protection must have a return authorization which is obtained from our Customer Service department. All returns must be shipped prepaid. Our KwikSafety RATTLER Safety Lanyard & Tool Lanyard Set minimizes trouble of shopping and any trouble on the job site. 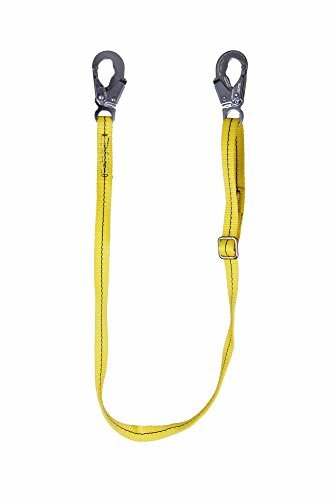 The 6 foot fall protection safety lanyard is equipped with (1) snap hook & (1) rebar hook to keep you safe on jobs or activities that require fall protection. 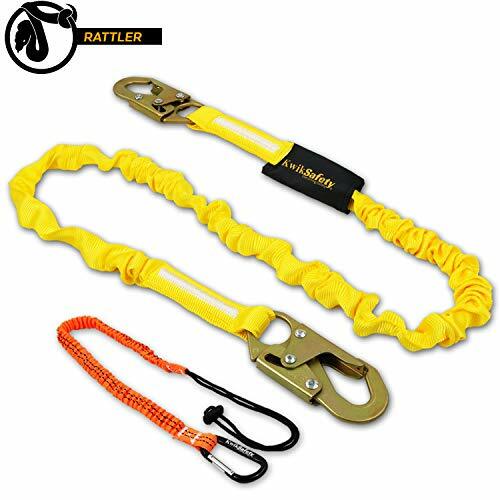 This tactical lanyard is designed to reduce the dangers of falling or slipping can be easily maneuvered and positioned around obstacles and obstructions while remaining secure and safe. Our Tool Lanyards is equipped with (1) small carabiner & a drawstring and chord lock for attaching to your harness and attaching tools. The highly conspicuous polyester material on both safety fall protection lanyard and tool lanyard is ultra-noticeable in direct sunlight, and aids visibility in foggy, dusty and dim-light conditions to help prevent accidents to those who wear it. The double-locking ANSI compliant hooks are user-friendly while providing substantial security. 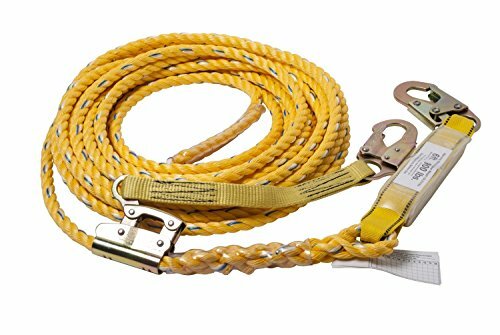 It's the ideal fall protection device for construction, welding, roofing, logging, arborists, climbing, emergency and rescue services, and other utility jobs at hazardous heights. DOUBLE, DOUBLE MINIMUM TROUBLE - Why shop separately when you can purchase the perfect pair in one place. Our KwikSafety RATTLER Lanyard Set comes with (1) 6 foot Positioning Lanyard and (1) Tool Lanyard to minimize the trouble. GET HOOKED - The internal shock-absorbing lanyard makes the RATTLER a more lightweight fall protection device. The dual-action, double-locking snap hooks prevent accidental rollout while remaining easy to latch on to your anchor point. 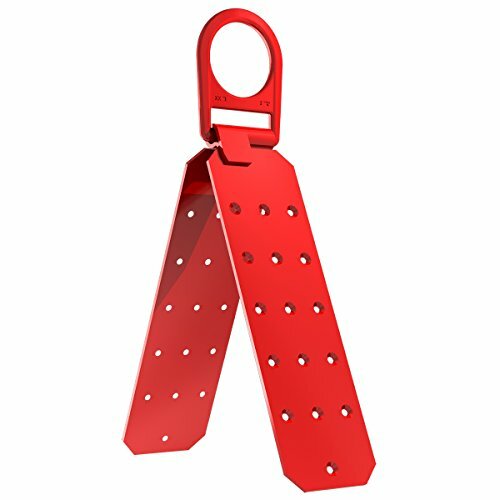 Tensile strength (max load) for the snap hook is rated at 5,000 pounds with a gate strength of 3,600 pounds. Meets American National Standards Institute (ANSI) Z359.12 standards. WEATHER ANY WEATHER - Use our KwikSafety RATTLER Lanyard Set in wet, dry, hot, or cold weather. Its high tensile strength, top quality static & dynamic performance free you from worries. Industrial safety fall protection is great for arborists, roofing, climbing, logging, inspection, emergency and rescue services, military, gutter cleaning, and other professional workplaces. The RATTLER Single Leg Lanyard is government approved, DOD approved, airport, port, RapidGate, and TWIC approved. SAFETY YOU CAN FALL BACK ON - We met the standard, then rose above it. KwikSafety's Single Leg Safety Lanyard exceeds the already-rigorous ANSI Z359.13-2013 testing standards and is heavy-duty, high-performance fall protection you can trust to have your back. Both Snap Hooks meet ANSI Z359.12 and CSA Z259.12 standards. Gate strength is rated at 3,600 lbs. ; avoid accidents with the double-locking mechanisms and anti-rollout gates. 33 long with 24 of very light force elongation minimizes pulling on your tool when reaching out. FULL ON FALL PROTECTION: You're ready to work hard up high right off the bat with KwikSafety's SCORPION Fall Protection System. The integrated single-leg lanyard and snap hook attached to the safety harness give you a complete safety package that's ready and proven to perform in the worst-case scenario. GET HOOKED: The internal shock-absorbing lanyard makes the SCORPION a more lightweight fall protection device. A dual-action, double-locking snap hook prevents accidental rollout while remaining easy to latch on to your anchor point. Tensile strength (max load) for the snap hook is rated at 5,000 pounds with a gate strength of 3,600 pounds. Meets American National Standards Institute (ANSI) Z359.12 standards. WE MET THE STANDARD, THEN ROSE ABOVE IT: ANSI/ ASSE Z359.11-2014 -- All of KwikSafety's full-body harnesses have undergone the Qualification and Verification Testing of Fall Protection Products. The SCORPION System exceeds the already-rigorous ANSI testing standards and is heavy-duty, high-performance fall protection you can trust to have your back. View the Compliance Label/ Safety Label for more information. PROPER FIT, PROPER PERFORMANCE: Correct fit is essential for proper performance. Our KwikSafety SCORPION full body harness and lanyard system supports users within the capacity range of 130 to 310 pounds (59 to 140 kg). To ensure proper fit, see that all buckles are connected and aligned, leg and shoulder straps are snug, and chest straps are in the center of the chest area. OSHA APPROVED: The Occupational Safety & Health Administration assures men and women safe and healthful working conditions by setting standards and providing training, outreach, education, and assistance. A personal fall arrest system is required when working 6ft. or more above lower levels. The SCORPION System is ideal for construction, arborist work, high-rise window cleaning, gutter cleaning, roofing and thatching, and Search and Rescue. Manufactured in Ontario, California USA by the same manufacturers that brought you KEY-BAK Retractable Reels, inventors of the self retracting key reel in 1948. Secure your outdoor gear with the T-REIGN Retractable Gear Tethers and never worry about dropping or losing your valuable outdoor gear again. Heavy duty Kevlar cord and rugged polycarbonate case, built for everyday use by working professionals. Stainless steel spring that is proven to last over 1-million pulls and backed by our Lifetime Service Policy. Warranty: Your product is a precision device and if your purchase from fails at any time within one year from date of purchase. With a proof of purchase, we will replace your product with an equal model. If at anytime after the 12 month warranty period ends and your product fails to perform we offer a Lifetime Service Policy. Opening or altering the product in any away voids this warranty. RATS Rapid Application Tourniquet is fast, easy and combat proven. 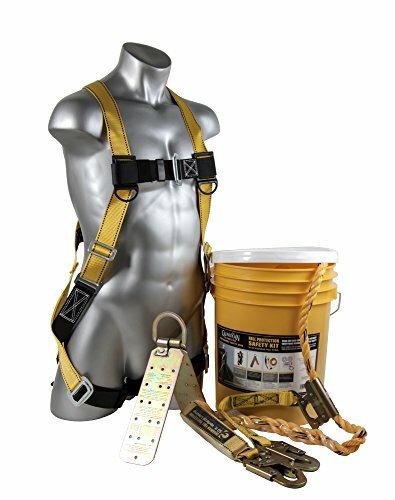 A complete fall arrest system requires three primary components; approved full Body harness, connector, and anchorage connector. Peakworks anchorage connectors are made of high quality materials that allow them to meet the most recent ANSI, CSA and OSHA requirements. Designed with an ergonomic frame to make handling more comfortable for the user; product is lightweight (weighing under 4 pounds) and composed of a durable aluminum housing; offers dependable performance with its quick-action braking system; meets or exceeds all applicable industry standards including OSHA and ANSI; no recertification is required with this product as it is considered a disposable unit; manufactured in the Taiwan. Our OSHA Approved and ANSI Compliant KwikSafety High Quality Fall Protection Safety Harness is great for any industry and any application. It has 1 -inches wide yellow load bearing straps and black lock stitched webbing to keep you safe and secure while working and if a fall were to occur. Our bright yellow load bearing straps are visible in various weather conditions: direct sunlight, foggy, dusty and dim-light. A Single (1) Dorsal Ring is located on the back of the Full Body Harness and is used as the primary fall arrester attachment. Water repellent safety webbing ergonomically supports back and hips while bearing the weight of the user as well as the weight of tools that may be attached. Here at KwikSafety craftsmanship, care and pride is taken with a critical eye when it comes to our products and to the workers safety. Our KwikSafety Single (1) Dorsal Ring Safety Harness meets or exceeds all applicable industry standards including OSHA and ANSI and is Government Approved, DOD Approved, Airport & Port Approved, and RapidGate and TWIC Approved. Great for use at Ports, Airports, Highways, Military Installations and Other Government Facilities. Our KwikSafety Full Body Harness is a One Size Fits Most with a height range of 4'10" to 6'6"; and a weight range of 130 lbs. to 310lbs. If happened to order the wrong size or item, we offer Hassle Free Returns within 30 days if your item was shipped via Amazon FBA! PROPER FIT, PROPER PERFORMANCE: Correct fit is essential for proper performance. Our KwikSafety Full Body Harness supports users within the capacity range of 130 to 310 pounds (59 to 140 kg). To ensure proper fit, ensure that all buckles are connected and aligned, leg and shoulder straps are snug, and chest straps are in the center of the chest area. REDUCE THE FEAR FACTOR: Our KwikSafety 1D Industrial Full Body Harness has one (1) Dorsal Ring that is located on the back of the Harness and is the primary fall arrester attachment. It can also be used for restraint and rescue. During a fall, our FBH directs the load through the shoulder straps and around the thighs. If a fall were to occur, the FBH will bring you to an upright position with a slight lean to the front. Some pressure may occur on the lower chest. SAFETY DESIGN REQUIRMENTS: If a fall were to occur, we want to ensure your safety by designing a safe and secure full body harness. The load bearing straps of our 1D Full Body Harness is made out of pure non-recycled synthetic material, which has the strength, ageing, abrasion and heat resistance that is equivalent or superior to polyester, and is lock stitched and securely back stitched together. LIGHT DUTY PERFORMANCE | The Tentacle tool lanyard is designed for light duty uses, namely hand tools and smaller power tools. 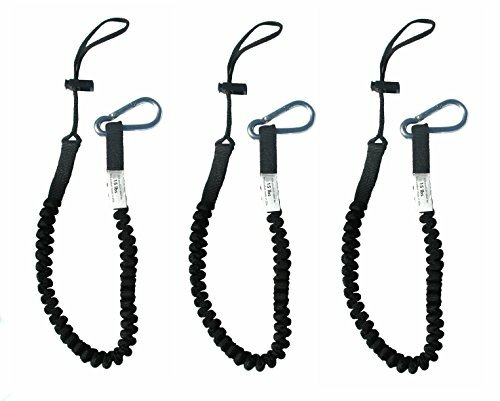 The lanyard has a durable bungee strap with a cord stopper with a durable rubber base to secure tools. 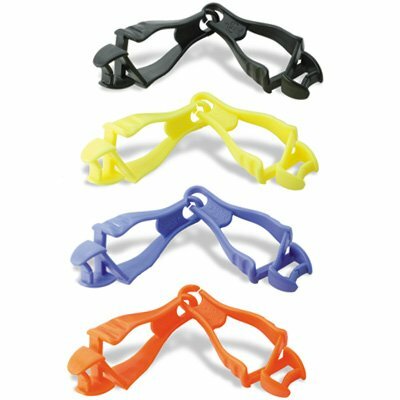 The anodized aluminum carabiner (does not rust!) is an easy quick snap clip. 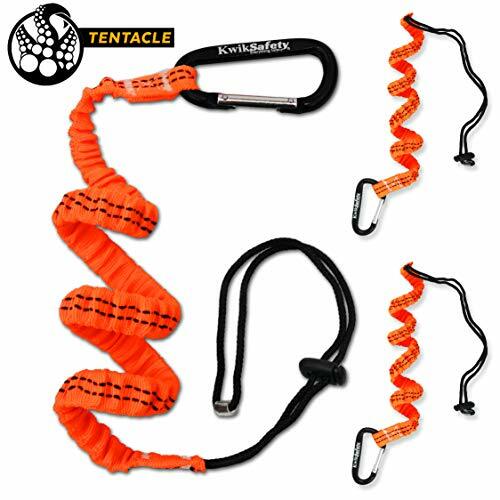 The Tentacle is third party tested to a max capacity of 20 lbs, resting length is 3ft and activated length is about 5 ft.
ALUMINUM CARABIENR (No Rust!) | The retractable tool ends have a small rubber base for extra grip on the tool that is secured. The snap carabineer is smoothly clipped / unclipped, and can be used independently. 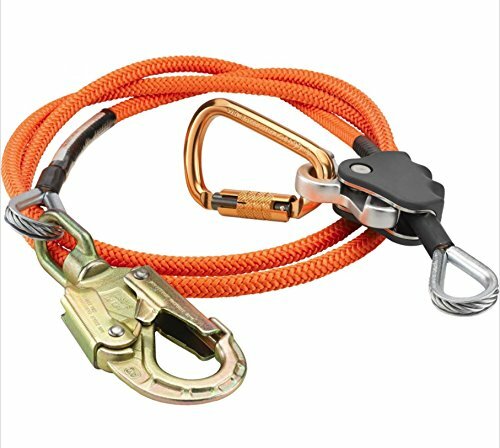 The aluminum carabiner is included for versatility of tool attachments. The shock absorbing chord properties reduces the force on the body / anchor point. ADJUSTABLE CLASP | The sliding clasp or choke is high quality durable mechanism that has very strong bite for a reliable grip on light and heavy tools / equipment. The locking mechanism is activated by user friendly thumb activated triggers, crimping only when released. The elastic lanyard band can swivel safely with a tool attached. The combo pack of shock cord stopper plus an anodized aluminum carabiner ensure all weather performance. PROFESSIONAL USES | The Tentacle works with your ANSI OSHA fall protection kit bucket, perfectly paired with your safety harness and safety lanyard used in construction, scaffolding, chemical plants, roofing, engineering, for roofers, tower climbers, ironworkers, tree trimmers, contractors and engineers. Tethering tools such as drills, saws, or hand tools like wrenches, pliers, measuring tape, screwdrivers and hammers to prevent tools dropping from a roof, ladder or tree. RECREATIONAL USES | Great for fishing rod leash, fly fishing, boating, climbing, repelling, camping, hiking, kayaking, biking, cycling, running and hunting. The orange outer material with the black trim is a sleek design to pair with any tool tie off accessory. This is a great tether for items such as fishing pliers, keys, cell phone, flashlight or fishing tool accessories. The Tentacle extends and retract very well and is ready for any job or activity on the road or water. Patented Grabbers keep your gloves, ice traction, cooling towels, keys and whatever else always seems to mysteriously disappear close at hand. The versatile dual clip version can be used as one unit or detached, clipped to d-rings and used as two separate pieces. Detachable, usable with 'beeners, D-rings, etc. Our 16 strand polyester rope over galvanized steel wire core rope features a bright neon orange cover that is tightly braided. It is perfect for demanding applications that require excellent UV and abrasion resistance and/or low stretch. It is also rot and mildew resistant. Its strong and rigid construction allows it to work well with various rope grab devices and prusik lines. Its tough, high tenacity polyester overwrap provides good grip and better handling than polyurethane, making it a sturdy, long-lasting cord. PREMIUM QUALITY - Our high visibility flip line is constructed with a 16-strand bright neon orange polyester tightly braided over a flexible heavy duty 1/4" diameter 7 X 19 galvanized steel wire core aircraft cable. Best suited for arborists who perform tree work services to sustain from falling down at high altitudes. HEAVY-DUTY CORE - Made of steel core, its strong and rigid construction allows it to work well with rope grab adjuster devices and prusik lines, while its tough, high tenacity polyester overwrap provides good grip and better handling than polyurethane, making it a sturdy, long-lasting cord. DIAMETER SIZE & LENGTHS - Choose from pre-made lengths of 8 feet, 10 feet, 12 feet, 14 feet, or 16 feet. Standard rope size diameter options: 1/2 inch, or 5/8 inch braided polyester cover over 1/4 diameter steel wire core. It is best you not use near electrical lines. COMPLETE KIT - Our most popular kit setup gives you all three common components used with a Flip Line for affordability, including a premium quality steel wire core rope line in the rope size diameter of choice (1/2 inch or 5/8 inch) and lengths (8 feet - 16 feet), along with Better Grab Rope Grab Adjuster (Non-Removable), Copper Head Carabiner, and Swivel Eye Snap Hook. 100% GUARANTEE - Our #1 priority is to provide our customers with the ultimate safety solutions that go far beyond regulation minimums for all our products. For over 40 years we have devoted countless hours into innovation, quality & customer service. Dependability is our hallmark; exceptional value is our everyday standard. The Malta Dynamics Warthog Full Body Universal Harness with Side D-Rings and Tongue Buckle Legs is the best available economy harness in the market. The Warthog has dual lanyard keepers to hold lanyards out of the way while working. The Warthog also comes with a Premium Velcro Label Jacket to protect the labels on the jobsite. The Warthog is designed efficiency and affordability while meeting the strict ANSI and OSHA testing requirements and standards.